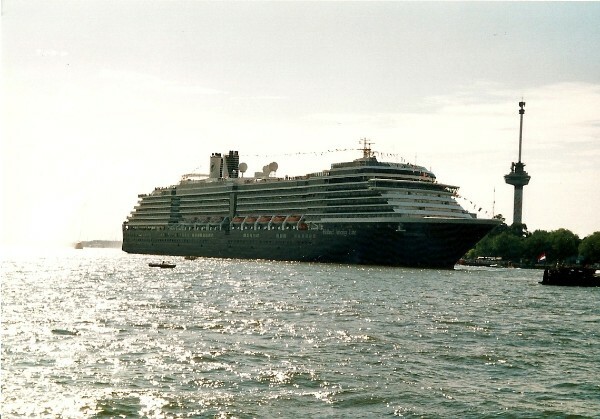 Below, Westerdam is shown sailing the New Waterway in the summer of 2004, passing the village of Maassluis, a town known as the main port for the well-known Smit tugs. 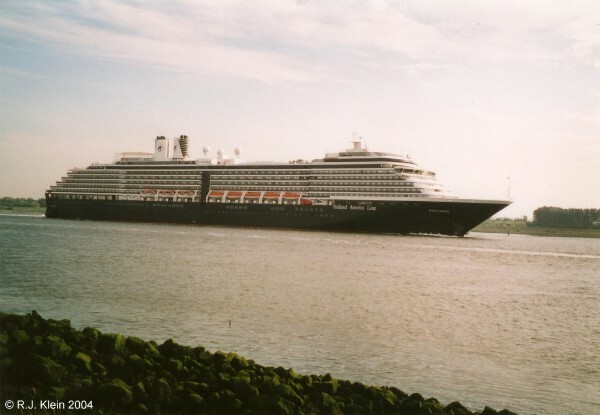 Westerdam was the thirth ship in the Vista-class that was introduced, following the Zuiderdam of 2001 and the Oosterdam of 2003. She was, like her sisters, built at the Marghera yards of Fincantieri in Italy and measures 81.811 tons. She has a lenght of 285,30 meters and a width of 32,20 meters. On her 11 passengerdecks, 1848 passengers and 800 crew can enjoy themselves. The ship is propelled by two ABB Azipods, powered by five diesel-electric generators and one gas turbine. She can sail up to 24 knots, but her normal service speed is 22 knots. Her naming ceremony took place in Venice, Italy at the 25th of april of 2004. The ships godmother is the Dutch actress René Soutendijk, who played in movies like 'Spetters' (1980), 'Eve of Destruction' (1991) and 'De scheepsjongens van Bontekoe' (2006). Her art-collection is themed 'the Dutch heritage in the New World', as her name suggests, the western point of the compass. Several paintings of ships, like Henry Hudson's Halve Maen and statues reflect this. Within her more contemporary collection is an original portrait of Andy Warhol. Westerdam is seen throughout the western world, cruising the Mediterranean, the rest of Europe, the Caribbean and both America's. In 2004, she also visited her homeport a few times and especially the first time, she was welcomed by many, remembering the naming ceremony of her sister Oosterdam a year before. In april of 2007, the ship was rebuilt to the 'Signature of Excellence'-standards , in which her stern was rebuilt where 34 staterooms were added, bringing her passenger capacity up to 1916 and her tonnage-measurement to 82.500. In this, the ship lost her more stylish stepped-back aft decks and looked more like the newbuild Noordam, the fourth sister in the same class of ships. Also, several public rooms were updated. 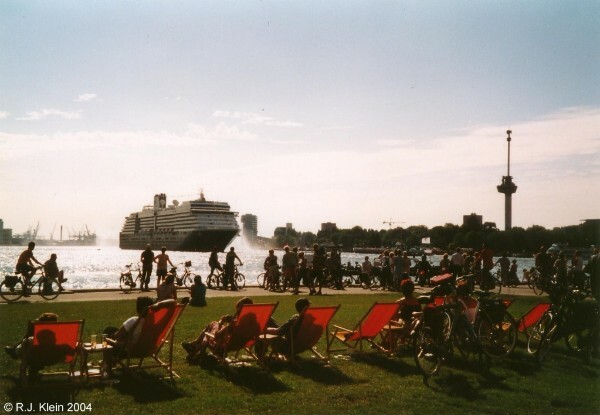 Below, it seems to be summer in Rotterdam! A lot of people showed up to wave the ship goodbye when she departed her homeport for the first time. The ship sails on without many interruptions, except for a time in may 2011, when she hit ice sailing the Yakutat Bay in Alaska. Because of this, a gash of 4,57 meters was struck in the ships hull below the waterline. Luckily, the hull wasn't breached and there were no injuries or pollution reported and the ship could be repaired. At the 26th of june 2015, a more dramatic incident happened when a waterplane carriing eight passengers and a pilot crashed near Ketchikan in Alaska. During an excursion, the plane hit a cliff and there had been no chance for the people aboard to survive the accident.